Right before giving one of the last big speeches of his presidency at the Democratic National Convention, President Obama got himself in the zone by listening to a bit of music, reports Uproxx. 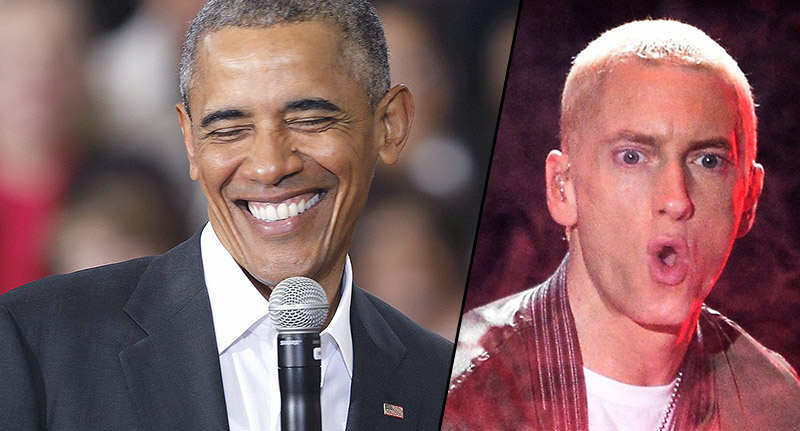 Needing something to get him focused and prepped to speak in front of a packed house – not to mention a massive television audience – Barack went for his go-to psych-up tune, Eminem’s 8 Mile classic, Lose Yourself – what else? Hillary Clinton’s campaign have released footage showing a snapshot of the epic moment which took place behind the scenes at the Philadelphia convention with the cameras catching Obama’s pre-match prep. Unfortunately we only get a short glimpse of the magical moment but there’s something reassuring about the man who holds the highest office in the land gearing himself up for a big moment with a bit of classic hip-hop. To be fair, we probably shouldn’t be too surprised – this is the same guy who has Jay-Z and Kendrick Lamar on the guest list for his birthday party.